Hello! I'm new to this forum... 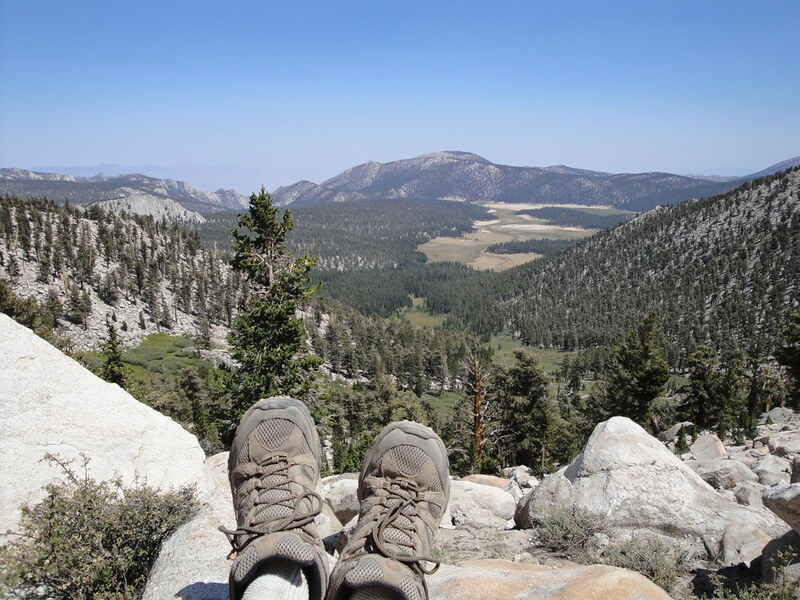 I am hiking Mt Whitney with a group of 14. We got our confirmation letter and our dates are June 1-3. I would not necessarily consider any of us very skilled backpackers, although we are somewhat experienced. Does anyone have some useful tips for first-timers? And will there be a lot of snow during that time? Have you read through all of the Feature Topics on the left tab of the board? "Orientation notes" is excellent, and so is the "What can go wrong" heading. Of course, after reading through these topics, more questions than answers will be generated ! My advice as always is: Get Doug Thompson's Book, "Mountain Lore from the Whitney Store". #2: Hike a few times at elevation if you can. By that I mean, get to 10,000 feet. If you're from SoCal, there are a few over 10,000, Baldy, Gorgornio and San Jacinto. #4: Get to the Portal early to acclimate, walk around a while, talk to people at the store, rest and read. Have everything ready for the hike....relax. #5: Most Important: Enjoy your friends on the hike, take pictures and have fun. Don't make the summit the goal. Make your friendship and the experience the goal. First timers from the flat lands...according to your IP number. Therefore, a suggestion go 14,000' before you go is a problem since isn't a 5 hour drive to trailhead like it is for me. Read this board and ask questions...as many questions as you need answered. Read the orientation notes and take a peek at my website...the link is at the bottom of this post. Read about our May 2007 trip...and check out the pictures from that trip. Get to Lone Pine a couple of days early and ask the folks at Eastern Sierra InterAgency Visitors Center what the current conditions are like on the MMWT. Ask if they can suggest a hike into similar conditions. Such a hike might be Horseshoe Meadow to Cottonwood Pass, if you have problems getting over it, you will have similar problems somewhere along the MMWT. If conditions do not fit your skill set, you can come and go as high as your skills allow or cancel and come later in the year...late September or early October when permits will be available...and new snow may be a possibility. My guess snow will be an issue at the beginning of June this year. This means you will need to climb the chute from Trail Camp to Trail Crest, if you want to summit Mt. Whitney. To do this your group will have to have basic winter skills, ice axe, crampons and possible a climbing helmet...I always bring one when I feel rock fall is an issue or glissading is a possibility. Welcome to the WhitneyZone, Heather. I think the two most important things are the early date which means snow/ice is likely, and altitude acclimatization. This year is shaping up as a little above average for snow cover, so the 99 switchbacks part of the trail may not even be passable. In that situation, people climb the snow field just west of the switchbacks. And there, you want to go up early and get down before afternoon shadows set in and possibly ice up that area (which makes it much more dangerous). You didn't say anything about high-altitude experience, so assuming you haven't been above 13,000 ft before, be sure you read up on what can happen (most often, headache and nausea). It REALLY helps to spend time, at least 24 hours at altitudes of 10,000 before the hike to let your body get accustomed to the elevation. Horseshoe meadows is usually the best place for that. When it comes to deciding where to camp, lots of overnighters like to push to Trail Camp at 12,500 ft. But that can be a struggle with a full backpack. On the other hand, backpacking only to Outpost Camp can be easier, and still put you within reasonable distance of the summit. You sleep lower, so the altitude won't hit so hard -- maybe even increasing your acclimatization. You have lots of people in your group, so tell them about this site, and especially the Orientation Notes link (above on the left). Heather, being a fellow lowlander I strongly recommend this route as a prep & acclimation hike. It's very close to the Whitney Portal and is only about 9 miles RT - half a day at the worst. It'll get you well above 11,000 feet and has a series of about 35 switchbacks that take you to the Pass (good practice for boredom control if you wind up hiking Whitney's 97 switchbacks instead of going up the chute). Oh yeah - and the view from the Pass is gorgeous! What I really like are at top of climb out from Chicken Spring Lake. I suspect this year there is going to be a lot snow in the beginning of June, especially on the north slopes like the 97 Switchbacks. I was in knee deep snow this past weekend at 10,000' coming down north side of San G. God only know what has consolidated under the soft stuff. Bulldog, What I really like are at top of climb out from Chicken Spring Lake. wb, didn't make it quite as far as CSL - once I topped out on the pass I scrambled up the boulders to the right for an eagle-eye view of the area, had lunch and headed back to Horseshoe Meadow. I counted those damn switchbacks on the way down - 37, if I recall correctly. I had hiked the Cottonwood Lakes Trail the day before, so I had already visited most of the lakes above the pass. My family will be with me this year, and I think I'll treat them to the Cottonwood Pass hike before we do Whitney. That's a cool picture, Bulldog. As an aside, after two days of hiking "Cottonwood" trails I was scratching my head at not seeing a single cottonwood tree. Call me crazy, but two trails named Cottonwood should produce a cottonwood tree or two - right? I posted that question on WPS and discovered that they used to be abundant in the drainage, but are long since gone. Coming back from the Trailmaster Peak last year, I got sick and tired of the those 37 stinking switchbacks and screamed when is this ever going to end! Then, there was the joy finishing up in the sand Horseshoe Meadow. The views are great but for some reason this pass grinds on me a bit. I much prefer going over New Army or Army Passes when utilizing Horseshoe Meadow as a start point. That said, I'm going back in mid-June to do Cirque and Trail Peaks. wb, Amen to that stupid beach sand - I despise it! Takes twice the energy to hike in that stuff. At times I wished I had snowshoes. After two days of that crap I bought gaiters in Lone Pine just to keep the sand outta my boots. Seems to be more of it in the Sierra than anywhere else I've hiked around the country ('cept Death Valley - lot of it there too in the alluvial fans). The Rockies are not nearly as bad, and the Cascades are virtually free of it. Re those switchbacks: On the way down from the pass I came across a couple on horseback working their way up. I was astounded since there are some pretty tight turns near the pass, but Horseshoe Meadow seems to be an equestrian hangout so I suppose they knew what they were doing. I was tempted to hang around and see how their descent went - I just couldn't picture it. If they were smart, they just looped around the Lakes trail back to the parking lot. Those boots looked so much like mine I had to go get mine out to compare.Mine are very similar but not the same.I am like Steve. I have an extra wide foot with a really high arch. My feet have actually gotten bigger. I guess they are flattening and spreading out. I have gone from an 9 EEE to 9 1/2 EEEE.Not an easy foot to shoe but especially difficult to boot. Those boots looked so much like mine I had to go get mine out to compare. Merrells baby! That pair has taken me close to 1000 miles on trails in 7 different states over the past 3 years, and the Vibram soles are still as good as new. Never slipped on rock once with those soles. Never had a blister either, but I always use silk liners. I hike in Merrells exclusively and it's only the second pair I've owned in the past 7 years. I love their mid-weights hikers - they just seem to fit me more comfortably than any other brand. Last year after coming down from Whitney I hurt in a lot of places, but not my feet. Thanks, everyone, you've all been so helpful!!!! Generated in 0.044 seconds in which 0.035 seconds were spent on a total of 14 queries. Zlib compression disabled.